I've got plenty of new posts in the works but felt like updating y'all on a few upcoming openings and news regarding new projects. Avalon, the new name of the stalled Prospect Park project in Alpharetta off Old Milton Parkway, recently confirmed it has a number of new restaurants and retailers signing on for the project. Marlow's Tavern, Yeah! Burger, Ted's Montana Grill and CRU Food & Wine Bar all plan to open in the project. These announcements follow the news that Ford Fry of The Optimist and No. 246 and the as yet unnamed Colonial American eatery coming soon to the former Nava will open an as yet unconcepted restaurant in the project. Previously announced tenants include Whole Foods Market (a re-commitment from Prospect Park), Regal Cinemas, Orvis, Banana Republic, Athleta, Paper Source, Fab'rik, Anthropologie, Yard House and Arhaus. North American Proprieties the current owner of Atlantic Station and developer of Avalon, has said other retailers such as C. Wonder, Tommy Bahama and J. Crew are in lease discussions. Luxury retailers such as Tiffany & Co and Kate Spade, whom were both mentioned as "in talks" to open in Prospect Park years ago, were both also mentioned as retailers that "could be" included in a planned phase two of the project. Phase one of the project is slated to begin construction in the first quarter of next year with a planned completion in April 2014. It's not yet known when the proposed phase two would begin construction. Fuqua Development has filed plans to redevelop a number of parcels along Piedmont Avenue, near Cheshire Bridge Roads into 300 apartments and 36,000 square feet of retail to be known as Archstone Rock Springs. Colorado-based Archstone would build the branding behind the apartments with it yet unknown what retailers or restaurant may have interest in the space. Current tenants such as Sheik Burritos n Kabobs, Atlanta's only Taco Cabana and Pot & Pan would all be displaced as a result of the planned redevelopment. The center dates from the 50s, and up until a few years ago was home to Artlite, and locations of both Northside Tool Rental and Psycho Sisters. Sources tell me that as recently as last year there was talk of a Walmart Neighborhood Market in addition to a QuikTrip being built instead of apartments on the same parcels but that plan never gained traction. Personally, both the current plan and the failed plan seem rather terrible given the traffic congestion issues that already exist at that intersection. There is no debating the fact that the area and especially that strip of centers could use a facelift, but I don't think this plan is the answer. Fuqua Development is run by president Jeff Fuqua, formerly of Sembler, where he was responsible for the redevelopment of Lindbergh Plaza as well as the developments of TOWN Brookhaven and Perimeter Place. Fuqua Development was started this past March and is already involved in a number of controversial projects including Lindbergh Place, adjacent to the Sembler developed Lindbergh Plaza. Lindbergh Plaza proposed to include a new Walmart Supercenter but has faced serious backlash from neighbors and area neighborhood associations and the Atlanta City Council who earlier this month rejected the Walmart as its proposed. Glenwood Place at Glenwood Avenue and Bill Kennedy Way is another mixed use project planned to include 170,000 square feet of retail and potentially another Walmart, though likely their neighborhood market concept. Emory Point, the new mixed use project being built on Clifton Road across from the CDC and near Emory, just saw its first tenant open : JoS A. Bank. The men's clothing retailer is the first of many planned openings at the center, and will soon be followed by women's retailer Fab'rik later this month. In November, women's retailers LOFT, American Threads and Lizard Thicket plan to open in addition to restaurants Bonefish Grill, Paradise Biryani Pointe, Marlow's Tavern and Which Wich?. Solar Dimensions and Jasmin Spa are also slated to open in November. North Palm Beach, Florida-based BurgerFi plans to open their first Atlanta area location in the project in December and will be joined by a new location of F2o (Fresh to Order ) as well as La Tagliatella, a Europe-based chain featuring Italian pizzas and pastas. This coming January, The General Muir, billed as a traditional Jewish style deli from the owners of the popular West Egg Cafe, will open in the project and will be helmed by Todd Ginsberg, who will leave Bocado next week after a three year run. 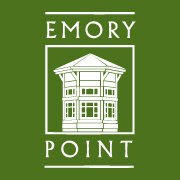 Tin Lizzy's and a CVS Pharmacy also plan to open Emory Point in January. Lips, a New York-based drag theater and restaurant plans to open what will be its fourth location, on Buford Highway in March. The sixteen year old restaurant and theater concept will open in place of Club Miami at 3011 Buford Highway in a predominately Hispanic stretch of town, making the location a little odd. The concept seems better suited for midtown, sometimes called the "gayborhood" given its large percentage of gay men. The chain also has locations in San Diego and Fort Lauderdale. Del Frisco's Grille just completed its outdoor patio and will open to the public this coming Saturday the 13th in front of the Mandarin Oriental Hotel in Buckhead. Del Frisco's Grille is the more casual concept from Del Frisco's Restaurant Group, the Texas-based group that went public earlier this summer, and also owns Del Frisco's Double Eagle Steakhouse and Sullivan's Steakhouse. LongHorn Steakhouse is on the move at Akers Mill Shopping Center in Cobb County. The restaurant will move from its current location along Cobb Parkway to within the shopping center itself, taking what I'm told amounts to one third of the former Circuit City, apparently representing nearly a 50% increase in size for the restaurant. Although Darden, the restaurants owner, had earlier hoped to be open in early November, construction delays have pushed the planned opening to early December. The old location is referred to as a "rodeo" style location whereas the new location is the more current "ranch" style design. Republic of Couture (ROC), a Miami-based multi-brand retailer plans to open next spring at 1075 Peachtree as part of the 12th & Midtown project. The retailer was started in 2002, and today has six locations, with Atlanta set to be their seventh and so-called "flagship." Although I've never been to the retailer, its theme and product lines seem eerily similar to the ill-fated Thread House that last only a short time at Plaza Midtown, not far away. Big Peach Running Co. is also opening in midtown on Peachtree, between 5th & 6th Streets in the former Pedini space. Big Peach currently has six area locations from Buckhead to Suwanee. What project are you most looking forward to? What opening do you just not care about? What new to market restaurant or retailer excites you the most? Please share your thoughts in the comment section below. Any news on what's going to happen to the empty space in the CNN Center atrium (where the bookstore and Don Julio's used to be). The Fuqua Development on Piedmont is a *HORRIBLE* idea. Traffic in that area is atrocious on a good day and having folks try to turn left into that plaza would be a nightmare (more so than it already is). The only solution would be to add yet another traffic light. There will be a new traffic light installed about where the bike shop is. This was all already approved back when Opus South was going to develop the same concept in 2008. They lost the deal as the economy collapsed.. the original deal with the city was also to give up enough frontage along piedmont to allow the road to be widened to allow a dedicated turning lane which is currently absent and part of the problem with congestion.